I love my quaint little suburban town. It’s made up of equal parts good country folk and wannabe Nashville hipsters with just a dash of California transplants to make things interesting. At about 70,000 people, it is just big enough to have what we need, but not so large as to feel like a metropolis. Historic homes, Civil War battlefields and gorgeous horse farms make it a joy to run through. The Franklin Classic is a race that shows off the highlights of our town as it winds a 10 K loop through the historic downtown each Labor Day. It benefits Mercy Children’s Clinic, a local organization providing free health care to children and adults at need. A beautiful sunrise at the over the square. I’d been training for the race for 6 weeks by adding hill sprints and tempo runs into my routine. I ran my tempo runs at a 7:40 pace with hopes of running a sub 48:00 10K but alas, it was not meant to be. Once again the weather was not it my favor. At 7 am the temperature was 75 degrees with 97% humidity. The air was THICK. Even as I was warming up, I was already doubting my time. 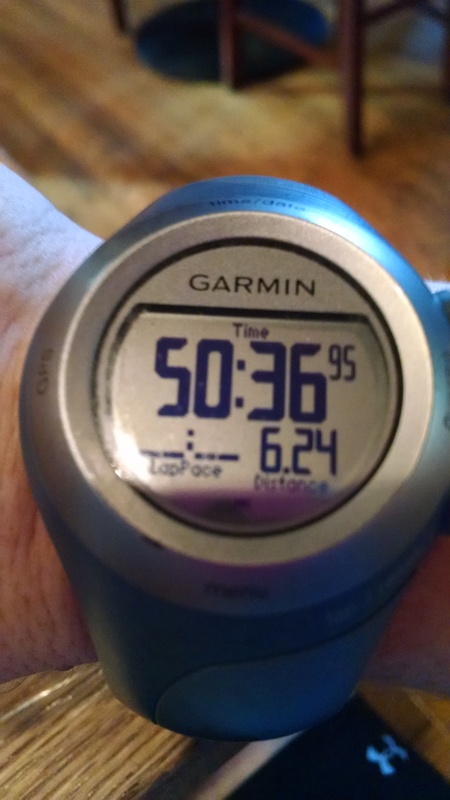 My plan was to run the first mile at 8 min/ mile pace and then try to crank up my pace to 7:30, if I felt strong. Most races I get caught up in the excitement and start off too fast, but this time I didn’t have that problem. I felt like I had to push myself to keep my pace from the start. Even so, I was right on target the first 3 miles, but honestly I just got really hot and tired. It felt like I was running through Jello. The course was beautiful but hilly. If I hadn’t been concentrating so hard on simply putting one foot in front of the other, I might have enjoyed historic grave yards and gorgeous horse farms along the way. As always, the race was well organized and attended. Rumor has it Ashley Judd was among the runners, but I didn’t see her. The last 2 miles I dropped my pace to 8:30. Realizing I wouldn’t make 48:00, I was hopeful to get sub 50:00; but as I rounded the final turn to finish up main street I saw the clock and realized I wouldn’t make it. I was going as fast as I could go without vomiting. 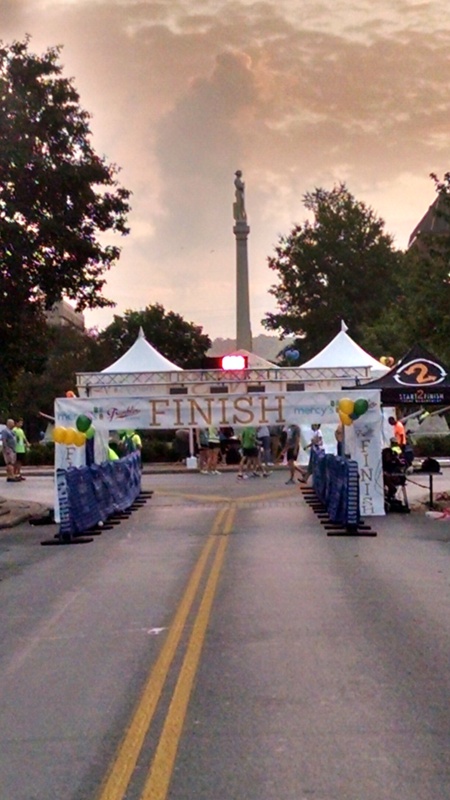 Running down Main street, into the historic square is a great way to finish the race. I was disappointed in my time initially, but it was still a 3 minute PR for me. My goal was likely too ambitious for that course. I’ll be back next year to support a great cause and have fun, but I’ll cross my fingers for a little less humidity. 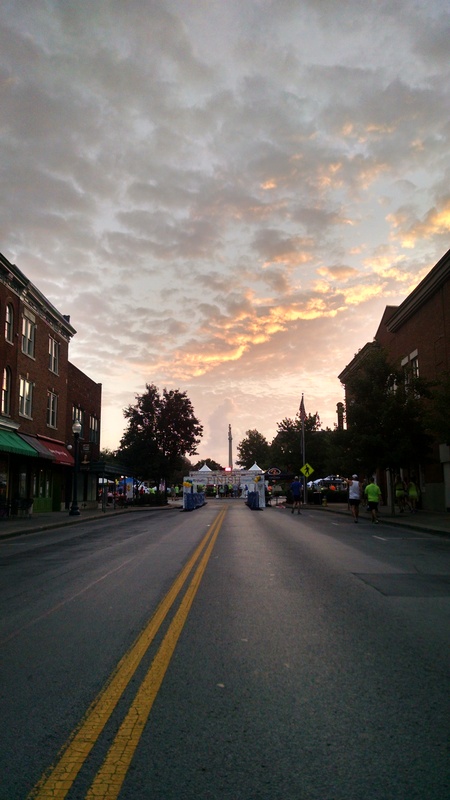 This entry was posted in Running and tagged 10K Race, Franklin Classic on September 14, 2014 by drrupe.